​CHECK OUT YOUR STATE BELOW! Indeed, if a woman is found to have dense breasts on a mammogram, as of July 2015, in 24 states so far, a breast density notification law mandates that a letter be sent to the woman informing that she has dense breasts. "The intent of such a law was to give women the necessary information to decide on further action if they had dense breast tissue. Dense breast tissue makes it harder to identify cancer on a mammogram and may also be associated with an increased risk of breast cancer, according to the American College of Radiology. Women with dense breasts are encouraged to discuss with their physicians their possible increased risk of breast cancer and the difficulty that mammography may have in detecting tumors." Time for further testing! 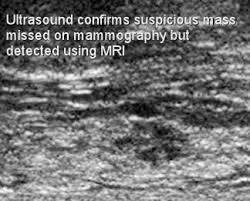 How about an ultrasound, which is helpful in dense breast imaging? While Connecticut passed the first breast density notification law in 2009, many, many states have followed, such as California, New York, and Pennsylvania. CHECK THE MAP ABOVE. http://www.diagnosticimaging.com/breast-imaging/breast-density-notification-laws-state-interactive-map#sthash.nXIJf0Q9.dpuf. Since an ultrasound does NOT use radiation, especially if you are younger and have dense breasts, you may wish to consider getting an ultrasound in lieu of a mammogram. However, different hospitals and different insurance companies have their own rules for screening protocols., mostly favoring mammograms. 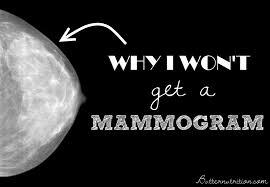 Nevertheless, it is always worth a concerted effort to try to get an ultrasound if you do not wish to have a mammogram. 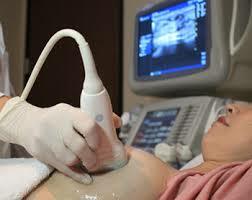 ​ "Ultrasound, also known as sonography, uses sound waves to outline a part of the body. For this test, a small, microphone-like instrument called a transducer, is placed on the skin (which is often first lubricated with ultrasound gel). It emits sound waves and picks up the echoes as they bounce off body tissues. The echoes are converted by a computer into a black and white image that is displayed on a computer screen. This test is painless and does not expose you to radiation. (No radiation!) Ultrasound has become a valuable tool to use along with mammography because it is widely available and less expensive than other options, such as MRI. Usually, breast ultrasound is used to target a specific area of concern found on the mammogram." Note that ultrasounds are generally thought to be a second-look, to see if a problem area on a mammogram is a solid (tumor) or liquid (fluid-filled cyst). Ultrasounds! .... According to a 2015 study, " ... Ultrasound measurements being slightly more accurate than mammogram measurements". In the Leddy R et al. 2015 study, the researchers sought to compare the accuracy of the tumor size via mammograms, MRIs, or ultrasounds. For their study, "Records from patients who underwent breast cancer lumpectomy between 2008 and 2012 and in whom tumor was seen on all three imaging modalities were retrospectively reviewed for maximum tumor size measurements." Conclusion: "Preoperative MRI significantly overestimated tumor size. Measurements obtained on ultrasounds and mammograms were more accurate irrespective of breast density, with ultrasound measurements being slightly more accurate than mammogram measurements." YOUNG? DENSE BREASTS? HIGH RISK FOR BREAST CANCER? In the Shen S et al. 2015 study, the researchers evaluated both the cost and effectiveness of ultrasounds as opposed to mammograms in high-risk Chinese women. High-risk Chinese women were screened either by "mammography alone, ultrasound alone, or by both methods at the time of enrollment in the study and at one year follow-up". Results: "Among the 30 cancers (of which 15 were stage0/1) detected, 5 were in the mammography group, 11 in the ultrasound group, and 14 in the combined group. In the combined group, ultrasound detected all the 14 cancers, whereas mammography detected 8, making ultrasound more sensitive with a better diagnostic accuracy." Why did ultrasounds prove to be more effective? "We attribute the low sensitivity of mammography in this study mainly to the effects of younger age of the study population with a mean age of 46 years and 68% of the women were premenopausal who are more likely to have denser breast tissue. Chinese women are commonly found to have dense breasts, with 66% classified as heterogeneous or extremely dense. ... Although age hardly affects the ultrasound exam, mammography appears to be more sensitive for patients over 50 years of age than those younger." 4.6 ADDITIONAL CANCERS FOUND AMONG 1000 WOMEN WITH NEGATIVE MAMMOGRAMS. On a mammogram, the mass was only given a 13% chance of being breast cancer. MRI did detect it. Ultrasound confirmed it. In the Hwang J-Y et al. 2015 study, the researchers sought to determine if an ultrasound exam following a negative mammogram might pick up additional cancers. Among 1727 women, from ages 30-76 (median 49.5 years), 78.1% had dense breasts on their mammograms, making the ultrasound an ideal test to find additional problems. As this THERMOGRAMS' section illustrates, thermography is NOT definitive for a diagnosis of breast cancer. However, thermograms may be useful to pick up signs of temperature change that may be indicative of pre-cancerous issues that will give a woman the opportunity to take steps to remedy these aberrant changes. "The sensitivity of thermography in breast cancer detection is low and the evidence does not support thermography as an alternative to screening mammography or for the investigation of symptoms." Meagan Brennan and Nehmat Houssami, 2013. "Thermography cannot be proclaimed as a screening method, without any evidence whatsoever." Brkljacic B et al., 2013..
" Thermograms may be useful for clarifying the significance of an abnormal mammogram or for adjunctive imaging of a highly suspicious palpated mass. However, the clinician needs to be prepared to translate the accuracy statistics for the patient and to carefully document informed consent in the event that the patient chooses to forego biopsy of a breast mass. ....There are other applications that might be more appropriate for thermograms that this article did not measure. These uses include the detection of precancerous dysplasia, the accurate assessment of long-term risk of developing breast cancer, and the evaluation of possible dysplasia developing in response to hormone replacement therapy." See Katherine Neubauer, ND, Are Breast Thermograms Enough to Use?, Natural Medicine Journal, 2011. "The use of Digital Infrared Imaging (DII thermography) is based on the principle that metabolic activity and vascular circulation in both pre-cancerous tissue and the area surrounding a developing breast cancer is almost always higher than in normal breast tissue. In an ever-increasing need for nutrients, cancerous tumors increase circulation to their cells by holding open existing blood vessels, opening dormant vessels, and creating new ones (neoangiogenesis). This process frequently results in an increase in regional surface temperatures of the breast. DII uses ultra-sensitive medical infrared cameras and sophisticated computers to detect, analyze, and produce high-resolution images of these temperature variations. Because of DII’s extreme sensitivity, these temperature variations may be among the earliest signs of breast cancer and/or a pre-cancerous state of the breast. What is the relationship between thermograms and diagnosed breast cancer tumors? In the Zore Z et al. 2015 experiment, thermograms were conducted on already diagnosed breast cancer patients prior to surgery. *Increased temperatures on the thermograms were more dependent on the IHC (showing receptors, such as hormone receptors and HER2 receptors)..
*Temperatures were the coldest for the hormone positive tumors ( HER2 negative) and more amenable to treatment. *Temperatures were the warmest for the tumors that are estrogen positive, progesterone negative, HER2 positive, and have a high proliferative Ki rate that are more difficult to treat. *Tumor size is irrelevant for temperatures. In 2013, Brennan and Houssami reviewed the literature on thermograms to assess thermography's efficacy in finding breast cancer. Review Results: Out of seventeen studies, four studies reported median sensitivity to finding breast cancer (47% with a range of 25–70%) and the median false-positive rate was 31% (range 21–38%). "Twelve studies reported thermography accuracy (9887 women) in the context of a known clinical or mammographic abnormality: median sensitivity was 59% (range 25–97%). Two studies found no association between abnormal thermography and an increased 5-year risk of developing breast cancer." IS THERMOGRAPHY A "FEASIBLE" METHOD TO SCREEN FOR BREAST CANCER? Yes!...... According to the Kolaric D et al. 2013 study finding thermograms can be used as a breast cancer imaging modality. For their study, "Ultrasounds, mammograms, and thermograms were done on 26 patients slated for breast cancer surgery. For the thermograms, "Thermographic imaging was performed using a new generation of digital thermal cameras with high sensitivity and resolution." Findings: " While mammography detected 31 changes in 26 patients, thermography was more sensitive and detected 6 more changes in the same patients. All 37 changes were subjected to the cytological analysis and it was found that 16 of samples were malignant, 8 were suspected malignant and 11 were benign with atypia or proliferation while only 2 samples had benign findings.... Statistical analysis of the data has shown a probability of a correct mammographic finding in 85% of the cases (sensitivity of 85%, specificity of 84%) and a probability of a correct thermographic finding in 92% of the cases (sensitivity of 100%, specificity of 79%)." Conclusion: " ... We believe that thermography should immediately find its place in the screening programs for early detection of breast carcinoma, in order to reduce the sufferings from this devastating disease." (See Kolaric D et al., Thermography -- A Feasible Method For Screening Breast Cancer?, Coll Antropol, 2013.) Editors' Note: See below for a dissenting opinion. No! ..... According to the Brkljacic B et al. 2013 study, there is no evidence supporting thermography.